Kee Avil is a solo song project based in Montreal, QC. It combines guitar, voice and electronics into song forms that stagger between structure and improvisation. Kee Avil evolved from playing the guitar with broken cymbals and drumsticks into creating strange beats glued together by samples of screws dropped into crystal bowls. Black Givre is Samuel Bobony solo project. A sound artist who creates explosive pieces which combines drum, sampling, field recording and synthesizer. Also member of Avec le Soleil Sortant de Sa Bouche (Constellation Records) & Héliodrome (Endemik Music). Erika Bell is a Los Angeles based composer drawn to intuition, preference and the personal. The result of these three things often show up in ways that are spacious, textural, and melancholy. Her work is lightly focused on textural construction, irregular ensemble groupings, and a structure-based approach. Bell has had work performed at the Walt Disney Concert Hall, Göteborg Art Sounds Festival (Sweden), Zebulon, The Dog Star Festival, the wulf., Human Resources, and more. Currently, Bell is preparing two album-length audio releases of her music. 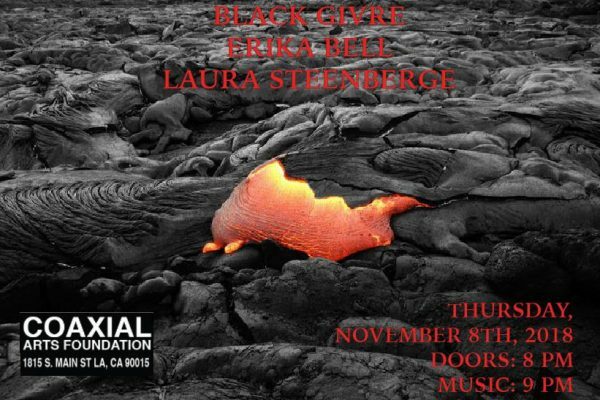 Laura Steenberge is a performer and composer in Los Angeles who researches language, the voice, mythology and acoustics. Influenced by folk music, psycholinguistics, acoustics and medieval Byzantine chant, collectively her work is a study of nonsense and the boundaries of knowledge. A multi-instrumentalist, vocalist and public speaker, Steenberge uses voice, contrabass, viola da gamba, objects, images to create works in traditional and site-specific locations throughout California, including SF MOMA, the Sutro Baths, the Hammer Museum, REDCAT and the Los Angeles County Museum of Art.